Here at LoadRite Canada, we’re big fans of “reduce, reuse, and recycle,” a phrase that you’ve probably heard a thousand times since its inception. When our parent company (one of the premier boat trailer manufacturers in the world) is making boat trailers large and small, recycling the unused steel and aluminum that goes into making the best boat trailers and utility trailers around is a priority. So when someone comes to us and asks if used boat trailers are an okay way to go, we’re a bit conflicted. Most of the time they’re talking about finding a used boat trailer online and purchasing it from a stranger. 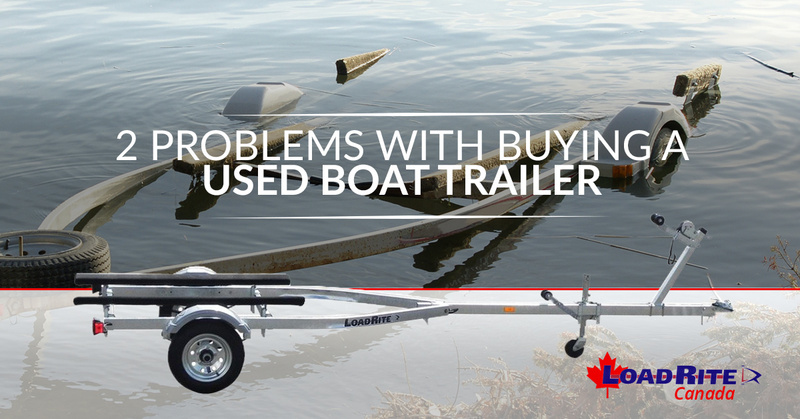 While we fully support the idea of “reuse” in reduce, reuse, and recycle, you have to be careful about buying a used boat trailer in Ontario. Let’s take a look at what might go wrong. Most of us have expressed shock at the way some people treat the items that they’ve paid good money for. Some people will spend hundreds of thousands of dollar on a house only to let it become run-down. Others will purchase a car and then fail to keep up the maintenance until the engine blows. Still other might buy a boat and then fail to properly winterize it. So while you might have every intention of taking care of that used boat trailer, that doesn’t mean the person before you did so. They might have left it out all winter without protection, or failed to dry it properly after removing it from the lake. Maybe they carried around a big boat on a small boat trailer, creating problems that are nearly impossible to see until the metal gives out. There’s also a good chance that they took it on bumpy back roads and hit those holes in the path a little too hard. If you’d like to avoid the problem of not knowing the history of your boat trailer or utility trailer, there’s one obvious option: buy a new boat trailer from LoadRite! When you go hunting on Craigslist or some other online site looking for boat trailers, you’re taking cash with you when you set up an appointment. You hand your money over to the person and drive off with your newly-acquired boat trailer. But what happens if something goes wrong with it? What if you get the empty trailer home and put your boat on it, only to notice that it’s sagging under the weight and threatens to break entirely? If you met the person in a parking lot, you’ve got no way to track them down and get your money back. Even if you picked it up from their house, what recourse do you really have if they say caveat emptor? At LoadRight, we guarantee you a guarantee! We have a 2 year + 3 year, coupler to tailgate warranty. While our trailers are of such high quality that it’s unlikely you’ll need to make use of it, at least it’s there. For the next five years you won’t have to worry about manufacturing problems with your LoadRite trailer. On the other hand, if you buy from Craigslist you have to worry about it from the moment the money leaves your hand. If buying a used boat trailer bothers you, we’re here to provide you with the best new boat trailers around. Stop by our Monkland or Innisfil yards today! ©2015 Marketing 360® All rights reserved. Do Not Copy.